Those who plan to use electric motors need information on types, characteristics, and efficiencies of motors and on advantages of each type. It is the purpose of this bulletin to give information that will enable us to make proper selection of electric motors for various purposes and to operate them properly. Regardless of type, the electric motor possesses certain advantages over other stationary power machines, particularly that of easy starting. Cold and hot weather have no effect on the readiness with which the electric motor starts. The compactness of the electric motor makes its use desirable where space is limited. If not overloaded, it will operate without odor or the emission of gases. It may be built for operating in any desired position. The operating speeds of electric motors ordinarily sold for farm purposes, except the small universal motors, are practically constant throughout the load range—that is, from no load to full load. Electric motors are relatively inexpensive and are available in a wide variety of forms and capacities, thus making it possible to fit them to almost any job requiring stationary power. During the past decade great improvements have been made in the design of and materials for farm machinery. In some cases the power required to drive machines has been greatly reduced. 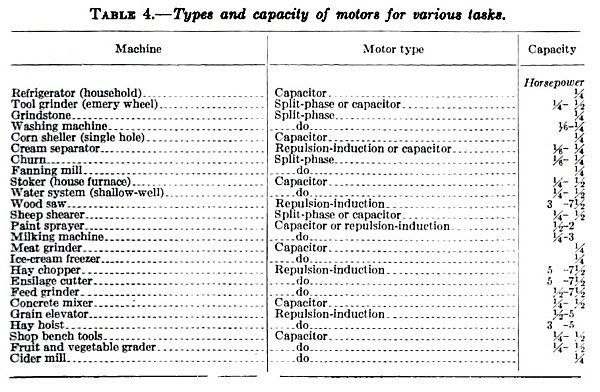 Such factors as load characteristics and speed regulation are now taken into consideration when selecting a motor to drive machines, whereas a few years ago the only consideration given to the selection of the motor was to be sure it had sufficient capacity to drive the machine under maximum working conditions. Then the motors used were almost always oversize and their use resulted in higher initial motor cost, greater power demand, low efficiency and power factor, and poor voltage regulation on the circuit. It is important in selecting a motor for a given duty to get one suited to the machine it is to drive. By so doing, it is frequently possible to use one of less horsepower than would be feasible if any motor that chanced to be readily available were used. It is, therefore, essential to know not only the characteristics of different types of motors but something about the characteristics of the machines under the load conditions at which they are to be run. It is not possible within the space of this bulletin to make recommendations for the operation of all kinds of farm machines. Manufacturers generally supply such recommendations, which are usually for new equipment in good condition. Allowance must be made for operation under somewhat less favorable conditions. Certain types of loads require motors with high starting torque. A deep-well plunger pump is an example of this type of load. When the water column is high the motor must not only overcome its own inertia but that of the pump mechanism and the water as well. It must really start more than its full load. The same thing may be said of any positive-action pump but not of the centrifugal pump. The centrifugal pump assumes its full load as operating speed is approached. Machines possessing high inertia, like the cream separator, require a high starting torque as compared with their operating load. This load becomes less as operating speed is approached, which is just the opposite of the starting characteristic of the centrifugal pump. A unit used to express the rate of flow of electricity. It is 1 coulomb per second. It is comparable to gallons per minute in discussing the rate of flow of water. The unit of electrical pressure. One volt will cause 1 ampere to flow through a conductor having 1 ohm of resistance. A unit of power. One volt multiplied by 1 ampere equals 1 watt; 110 volts multiplied by 5 amperes equals 550 watts; 1 horsepower equals 746 watts. A more usable term is the kilowatt, which is equal to 1,000 watts. Kilowatts multiplied by time in hours equals kilowatt-hours, frequently abbreviated kw.-hr. The flow of electricity along a conductor: its unit is the ampere. Current that flows first in one direction and then in the opposite direction at regular intervals. Any substance through or along which electricity may flow readily. Most metals are conductors. Of the baser metals, copper is the best conductor. Aluminum is frequently used as a conductor. Materials that will not carry current readily are known as insulators. Glass, dry air, cotton, and oil are good insulators. The part of a conductor that passes through the magnetic field of the motor. The property of a conductor that offers opposition to the flow of electricity. It manifests itself as heat. For a given material, the resistance is proportional to the length and inversely proportional to the cross-sectional area. To state this another way, a conductor twice as long as another of equal size will have twice the resistance, but a conductor of equal length and twice the cross-sectional area of another, will have half the resistance. Different materials of equal dimensions have different resistances. An iron wire has from 6 to 10 times the resistance of a copper wire of equal size and length. Other materials may have even more resistance. The space between the free ends of the poles in which magnetic force is present. A term which refers to the magnetic force. A complete change from a given value in one direction through all values in the opposite direction and back to the same value in the original direction. The number of times these complete changes occur in a second is known as frequency. The standard frequency of alternating current in this country is 60 cycles. The measure of the tendency of a force to rotate the body upon which it acts. Example: A pull on the spoke of a wheel. A pull of 1 pound at 1 foot from the center of rotation equals 1 pound-foot of torque. The relationship between the current and the voltage. Certain characteristics of electric circuits cause an alternating current to reach its maximum value either before or after the voltage reaches its maximum value. One or more currents flowing in an electrical system. For example: In a single-phase system but one current flows, while in a three-phase system three currents flow. A single-phase motor means that but one impressed voltage is required to operate it. The induced current of the rotor in a single-phase motor is not considered as constituting a second current. The change in magnetic flux linking a circuit when a change in current takes place. If a wire is included in the field where the magnetic flux is changing, a voltage is induced in the wire. The property, which causes a current to flow through one conductor due to the influence of magnetism set up around a changing current in another conductor is known as mutual inductance. The electrical pressure that is built up in an inductor or in a battery which causes an electric current to flow when the circuit is closed. It may be thought of as a difference in electrical pressure between any two points in an electric circuit. An analogy in hydraulics is pounds pressure per square inch, or feet head. Electrical pressure is often referred to as potential. The rotating part of a motor or generator. 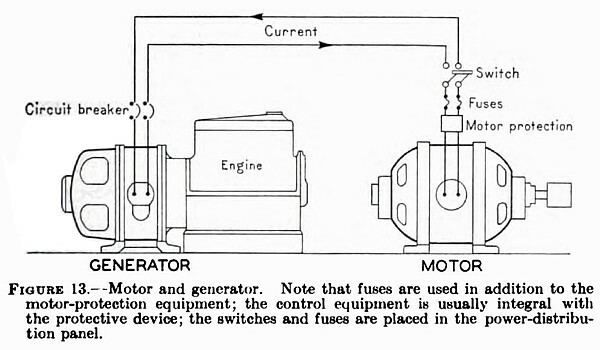 The stationary part of a motor or generator. In most small motors the stator contains the field windings. In larger motors and generators the rotor may contain the field poles. That part of the motor magnetic circuit around which the field windings are wound. The purpose is to confine the magnetic flux to given locations within the motor since iron will support many times as much magnetism as the same volume of air The pole in the alternating-current motor is made of laminated iron. A device which changes the direction of the flow of electricity through the rotating part. It consists of narrow copper bars insulated from each other by layers of mica. The ends of the rotor windings are soldered to the commutator bars or segments. Small carbon blocks which make contact with the commutator of an electric motor. These are used to carry electricity from the stationary to the rotating parts of the motor. An electrical device consisting of two or more electric conductors or plates separated by a thin insulating material, in which an electric charge may be stored temporarily. A term which expresses the phase relationship between the current and the voltage. Unity power factor denotes that the current and voltage are in phase; that is, arrive at the maximum value at the same time. It is the ratio of real power to apparent power. Direct current is always in phase with its voltage. An electric motor is a simple machine consisting of a frame, or stationary part, which is called the stator, and a rotating part, called the rotor. Both the stator and the rotor form a part of the magnetic circuit, and both are frames for supporting coils of wire. The electric current is usually conducted to the coils of the stator from an external circuit, but is frequently induced in the coils of the rotor by changes in the magnetic flux linkage due to the varying currents in the stator windings. Alternating-current motors may be divided into two general groups—single-phase and polyphase. This discussion will be limited to single-phase motors since practically all residential buildings are wired for and are connected to single-phase power lines. Polyphase motors are designed for use with polyphase power and should not be connected to single-phase circuits. Single-phase motors are designed for use on single-phase circuits but will operate just as well on three-phase circuits by connecting to any two of the three or four wires, provided the voltage is correct . They may be built in almost any capacity but usually are not built in sizes larger than 15 horsepower. Most single-phase motors are smaller than 5 horsepower. The use of single-phase motors larger than 5 horsepower is quite generally discouraged because of the unfavorable effect they have on power lines and transmission equipment (transformers, overload devices, etc.) when starting. As previously explained, one of the characteristics of single-phase motors is that they will operate equally well in either direction but must be started in the direction desired. All single-phase motors now on the market have starting devices built into them. Single-phase motors may be divided into four types depending on the methods employed for starting them in a predetermined direction. These types are: Split-phase, repulsion-induction, capacitor, and universal or series-wound. Each of these types has a starting characteristic peculiar to itself which makes it particularly adaptable to a certain kind of load. For example, a motor with a low starting torque is not suitable for use with a machine that requires a high torque to start and bring up to speed. Split-phase motors are equipped with special starting or auxiliary windings which form parallel circuits with the regular field windings. The starting winding is not needed after the motor has started to rotate. For this reason it may consist of comparatively small wire, thus allowing more space for the larger running winding or to limit the over-all size of the motor. Although the starting winding carries only a small current, it will overheat if allowed to remain in the circuit for more than a few seconds or minutes at most. If it is allowed to get too hot, it will burn out. The split-phase motor is equipped with a switch, which automatically opens the circuit to the starting windings when the motor attains a predetermined speed just a little below that at which it is intended to operate. The small current that flows through the starting winding of the split-phase motor is sufficient to start the motor but not sufficient to start a heavy load. The split-phase motor, therefore, has a low starting torque and should be used to drive machines that are easy to start and bring up to speed. The starting torque of this motor is about 1½ to 2 times its full-load torque. Figure 1 shows a cut-away section of a split-phase, fractional horsepower motor. Note that the section removed left a portion of one of the field coils intact but cut directly through another, a. The yoke, b, which forms the stationary magnetic path, is made up of laminations or thin sheets. Laminated construction is necessary in magnetic circuits where alternating currents are involved. The rotating part is also composed of laminated iron. The rotor (rotating part), c, has solid inductor bars (copper or aluminum) extending from one end of the rotor to the other. These bars are firmly attached to rings of low-resistance metal at both ends. This is known as a squirrel-cage winding because of the appearance it would have if nothing but the conducting material were present. 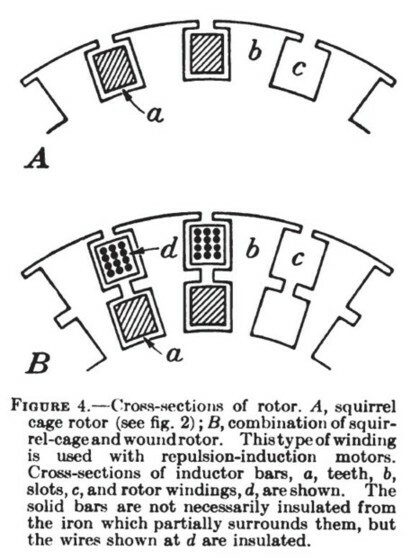 Figure 2 shows a rotor with squirrel-cage winding cut open to show the inductor bars. In figure 1 note the centrifugal mechanism at the right of the rotor. The design of this device is such that as the speed of the rotating parts approaches operating value the disk is pulled away from the electrical contacts, thus opening the circuit through the starting coil. Many other types of circuit-opening devices are used, but all depend upon overcoming springs by centrifugal action. Most motors demand larger current for starting than they do for normal running under full-rated load. Split-phase motors are no exception to this. They require from 5 to 7 times as much current for starting as for full-load operation. The speed range is 900, 1,200 and 1,800 revolutions per minute and is practically constant within load limits. The motor is reversed by interchanging the leads to the starting winding. The power factor is about 60 percent. Motors of this type are made in capacities up to one-half horsepower. Split-phase motors are suitable for use on washing machines, ironers, meat grinders, grindstones, small emery wheels, and small power tools such as bench saws and power drills that may be started with little effort. Although the term "repulsion-induction" is often applied to the repulsion-start induction motor, in reality the two types are somewhat different. The repulsion-start induction motor, as its name implies, starts as a repulsion motor and operates as an induction motor. 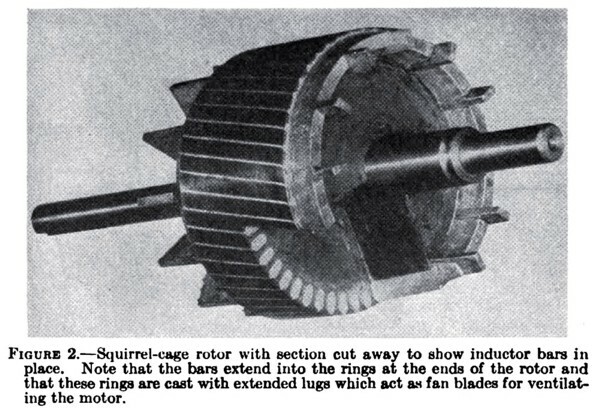 Upon reaching a predetermined speed just below that of normal operation, a centrifugal device, similar in principle to the centrifugal switch of the split-phase motor, operates to short-circuit the rotor windings by connecting all the commutator segments together and in effect forming a squirrel-cage winding, previously described. A repulsion-start induction motor is illustrated in the cutaway figure 3. 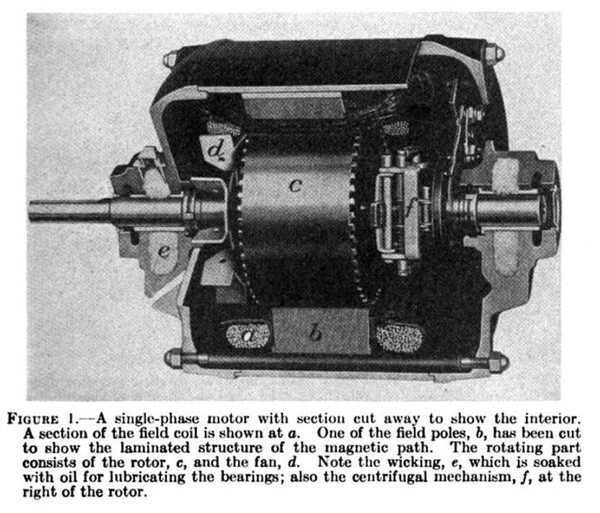 In the motor illustrated here the centrifugal mechanism, a, is at the end opposite the commutator. It also acts as a fan. Action of the centrifugal device, or governor, as it is sometimes called, is transferred to the brush holder and the short-circuiting segments, b. The governor is designed to move the brushes away from the commutator, c. with a snap action as the centrifugal device expands. In this particular motor the commutator bars or segments are arranged to form a disk rather than a cylinder, as is the case with most other motors. At the same time the brushes are moved away from the commutator the short-circuiting segments are forced into contact with the commutator segments. It will be observed that the brushes are electrically connected, which makes a low-resistance path through the armature windings. When the rotor is stationary, the only voltage induced in the rotor windings is that due to the changing magnetic field of the alternating current in the stator. This voltage is sufficient to send current through the rotor windings and produce a starting torque to start the motor. When the rotor begins to turn, another voltage is generated in the windings of the rotor, due to the combination of the changing magnetic-flux linkage caused by the rotation and the alternating current. This combination will produce sufficient unbalancing of the voltage in the rotor to cause a current to flow in the windings if the commutator segments are short-circuited. Because of the change in generated electromotive force (voltage) in the windings due to rotation, a motor of this type will produce torque. The current in the stator winding is limited by the generated voltage (back electromotive force) which to a large extent is regulated by the speed of the rotor, and this in turn is determined by the load the motor carries. The repulsion-start induction motor has a starting torque three to four times the running torque, but the starting current is limited to two to four times the running current. These motors are built in capacities ranging from ¼ to 15 horsepower, although there is some tendency toward replacing them in the fractional horsepower sizes by capacitor motors. They are usually more rugged and somewhat more expensive than other types of single-phase motors. These motors have inherently constant speed within the limits of their rated loads. They are made in all of the standard alternating current speed ratings starting at 600 and extending to 3,600 revolutions per minute. They are suitable for use with loads requiring comparatively high starting torques; for example, positive-acting pumps (plunger and gear pumps), milking machines, furnace stokers, cream separators, and many other machines requiring frequent starts. The repulsion-induction motor has two rotor windings, one of which may be a squirrel-cage or modification of it, while the other is similar to that of the repulsion-start induction motor. Figure 4 illustrates sections of armatures showing how the windings are laid in the slots. 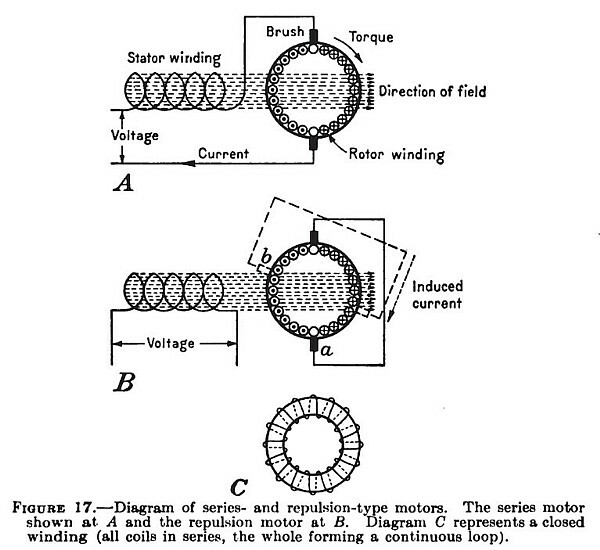 Figure 4, A, shows a squirrel-cage winding, and figure 4, B, shows the windings of a repulsion-induction motor. In winding the repulsion-start induction motor, wires similar to d in figure 4, B, replace the solid bars, a, in figure 4, A. When the repulsion-induction motor starts, the magnetic frequency will be 60 cycles per second (for a 60-cycle motor); and at this frequency the magnetic flux links the outside winding, which has a comparatively high resistance, as in the case of the repulsion-start induction motor. As the rotor approaches normal speed the magnetic frequency of the rotor becomes lower and lower, the lines penetrating into the. rotor deeper and deeper until at operating speed the magnetic flux is linking the inductor bars in the lower part of the slot. At synchronous speed the inductors will not intercept any magnetic lines of force, and no current will flow in the rotor windings. Hence, as this speed is approached, the current in the starting windings actually becomes very small. For this reason practically no current flows through the commutator and brushes at full speed of the motor. In this type of motor the brush-lifting and short-circuiting device is eliminated. The advantages of this feature are about offset by the extra friction of the brushes, which are constantly in contact with the commutator, and by the speed variation, which depends somewhat upon the voltage supply and becomes lower as the load increases. In other respects its characteristics are quite like that of the repulsion-start induction motor. Both motors are adaptable to the same type of loads. Both are reversed by shifting the brushes. The running position of the brushes in either direction is usually marked on the frame. It is claimed that the repulsion-induction motor is less likely to get out of order than the repulsion-start induction motor. Since the brushes ride the commutator continuously in the latter type of motor some wear occurs on both, and occasional replacements of the former with a reconditioning of the commutator at infrequent intervals are required. Should one of the brushes happen to have a hard spot, a groove may be worn into the commutator. To avoid the forming of such grooves, it is common practice in larger motors to allow some end play so that during operation the rotor may float back and forth a short distance, thus avoiding excessive wear in one place. This feature is possible with the sleeve bearing but not with the so-called frictionless ball bearing. If the speed requirements are not too exacting, this motor will perform as satisfactorily as the repulsion-start induction motor. The speed regulation is somewhat under the control of the designer; if practically constant speed is required, the motor can be designed accordingly. Capacitor motors are of two general types; namely, capacitor start and capacitor start-and-run. They are a form of split-phase motor having a capacitor (condenser) connected in series with the starting or auxiliary winding, which changes current-voltage relationship (phase) by capacitance and reactance rather than by resistance and reactance as is done in the ordinary split-phase motor. The starting winding is disconnected in the capacitor motor just the same as it is in the split-phase motor. Although the construction of the capacitor motor is practically the same as that of the split-phase motor, its characteristics are different. The starting torque is from 1½ to 2 times the running torque while the starting current may not exceed 3½ to 4½ times that required for running at full load. The capacitor start-and-run motor differs from the capacitor start motor in that a condenser is connected into the running circuit as well as into the starting circuit. These motors operate with an excellent power factor; are quiet and comparatively free from interference with radio reception. They are suitable for jobs requiring frequent starting, such as water pumps, refrigerators, furnace stokers, oil burners, and similar equipment. Since the condenser on the capacitor start-and-run motor usually has a fixed value, best results are obtained at definite starting and running loads. For this reason manufacturers must assume that these motors will operate at or near full load and install condensers accordingly. When a capacitor motor is ordered, the running load should be specified; also it should be stated whether or not the motor is expected to start under load. The speed of the capacitor motor is fairly constant, standard ratings being 900, 1,200, 1,800, and 3,600 revolutions per minute. It is reversed in the same manner as is the split-phase motor. 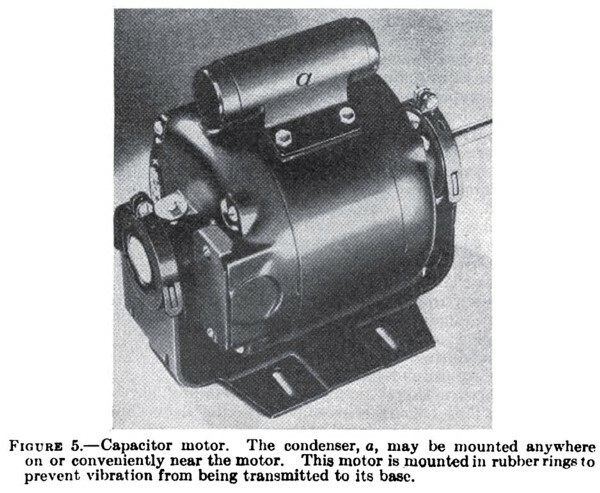 Figure 5 shows a capacitor motor with the condenser mounted on top. The frame of the motor is otherwise the same as that of a split-phase motor. Capacitor motors are available in all standard capacities from 1/6 to 1 horsepower, and larger capacities may be had on special order. The preceding discussion of capacitor motors applies to the general purpose motor. Capacitor motors are also designed for either high or low-starting torque. The high-torque motor has a starting torque varying from 2½ to 4 times the full-load torque with about the same starting current as that of the general-purpose motor. The low-torque motor is supplied with but one capacitor unit which serves for both starting and running. The capacitor is designed for full-load operation. The starting torque of these motors is only about 40 to 60 percent of full-speed torque. They are suitable for driving fans and other easy-starting loads. The term "universal" is applied to a group of fractional-horsepower motors that will operate on either direct or single-phase alternating current when at the proper voltage. They are series-wound and consequently have a high starting torque, but also a very high starting current. These motors have no inherent speed regulation. They will run at dangerously high speeds if allowed to operate without load, but their speed varies inversely with the load; that is, if the load is doubled the speed will be reduced by half. The speed is usually controlled by means of a variable resistor in the power circuit. Because they have no inherent speed regulation and will run at dangerously high speeds at no load, they are nearly always built into and become a part of the device they drive and as a result always operate under load. They are used on vacuum cleaners, sewing machines, floor polishers, food mixers, and other household appliances. 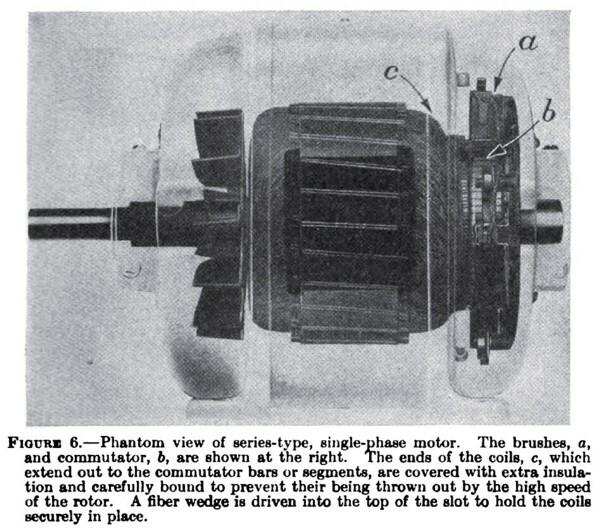 Figure 6 shows a phantom view of a universal or series-wound motor. The shaded part, except the brushes and brush holder, is the rotating part and is known as the rotor. The windings are shown at c. Proceeding around the armature in either direction, the end of one coil and the beginning of the next are at tached to the same commutator segment, as is done in the wound rotor of the repulsion-start induction motor, thus placing all the coils in series. These windings are carefully bound to prevent the rotating part from flying to pieces if the load is removed. 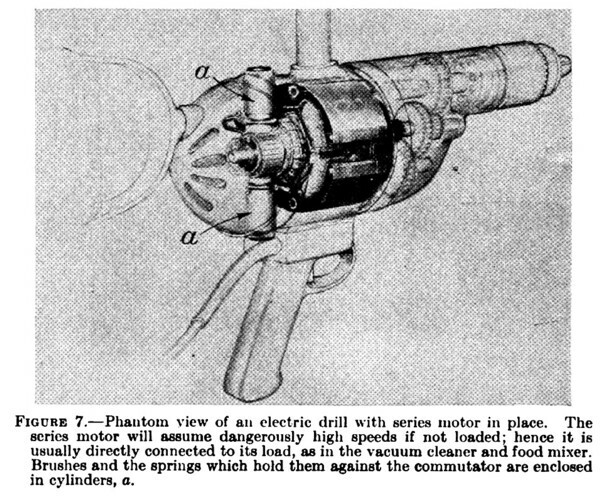 Figure 7 is another phantom view in which the motor is shown as a part of an electric hand drill. It is extremely important that the correct voltage be applied to an electric motor. The name plate of the motor tells how much power it will deliver at the shaft, the voltage to be applied, and the full load current the motor will take from the line in operation. Since the power output depends upon both the current and voltage, the motor cannot deliver its rated power on low voltage without taking more than its rated current. Heating due to an electric current increases as the square of the current. For example, suppose the normal current is 9 amperes and is increased to 10 amperes. The relative heating effect will be 92 as compared with 102, or as 81 is to 100. It is readily seen that, if the motor is designed to dissipate heat only as rapidly as it is generated under normal full-load conditions, a drop in voltage requiring an increase in current to maintain power will result in an overheated motor. An increase in voltage is serious only because of its effect on the insulation. High voltages are liable to puncture the insulation and cause grounds or short circuits. The value or amount of current carried by the wire, measured in amperes. the size of the wire. the length of the wire. The voltage applied to the motor should be within 2 percent of that specified by the name plate. 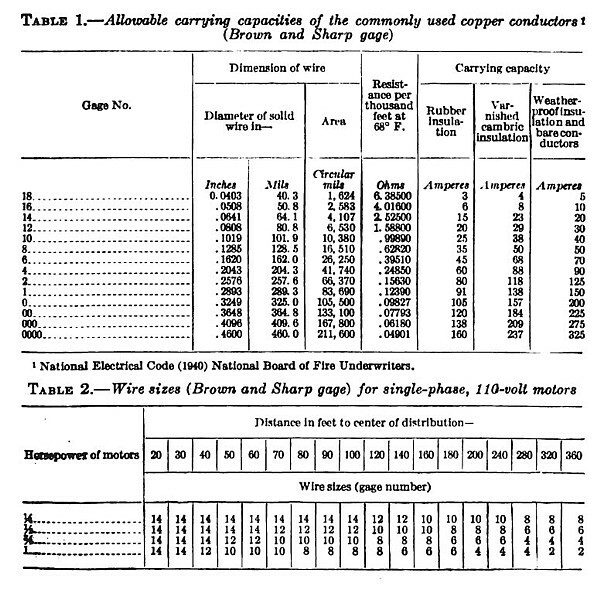 Tables 1,2, and 3 are given as a guide in selecting the correct size of wire for several sizes of motors located at different distances from the transformer. Table 1 gives the area in circular mils and allowable carrying capacity for different sizes of wire. 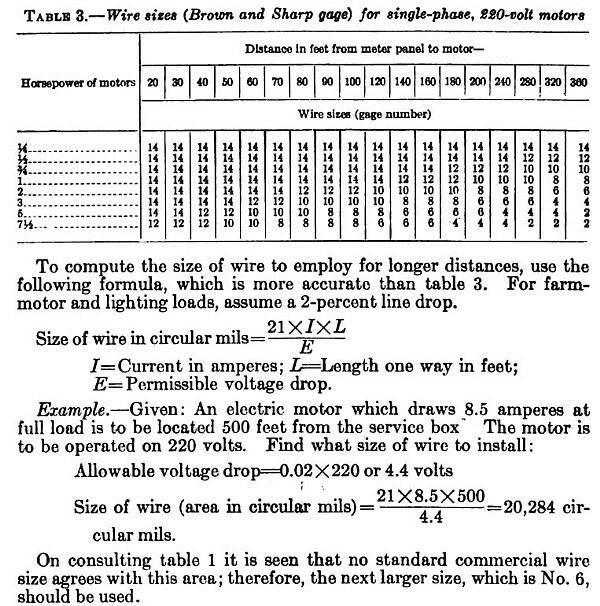 Tables 2 and 3 are included for convenience in determining wire sizes for a few sizes of motors at given distances from the transformer. The wires and other parts must be kept insulated from each other where insulation is intended and must form a complete electric circuit. the motor must be kept free from foreign substances so that it can radiate the heat that is generated in its windings. A motor as part of an electric circuit is subjected to differences in potentials between windings, and other parts and currents must be conducted through these windings. These coils must maintain their proper positions with respect to the magnetic flux. If, for any reason, the current does not follow its proper course, damage to the motor results. The electric current will follow the conducting wires around the coils as long as the insulation is intact; but, if the insulating materials become weak or broken, the current will pass from coil to coil across a shorter path and burn the insulation. This is known as a short circuit. Of all the materials used in a motor, the insulating materials have the shortest life. They are likely to be injured by moisture, by excessive rise in temperature, or by such substances as oil, salt, or acid. Care should be taken to keep the insulating materials clean and dry and free from substances that will damage them. Motors that are idle are more likely to be damaged by atmospheric moisture than those in use. Motors located in damp places such as basements should be of the splash-proof type. They should not remain idle for long periods. The heat and fanning action obtained by running a motor will help to keep the insulation dry. Insulation on motor conductors contains some material that will carbonize and become a conductor if subjected to a high temperature. Usually the excessive temperature occurs at one spot and may not at first interfere with the performance of a motor. For this reason a motor should be inspected occasionally to see if the insulation is worn off the conductors at any place, if there are any burned places where current has been taking short cuts, or if there is excessive accumulation of dirt or oil on the windings that might cause local heating. In case any such places are found the winding should be cleaned and repaired. The best insurance against failure of insulation is to keep the motor clean and dry and located where it will be well ventilated. A dustproof or enclosed motor should be used in places where it is impractical to eliminate dust. 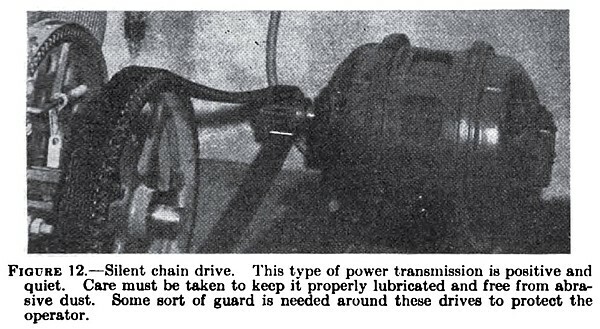 Even under comparatively clean conditions some dust and dirt will accumulate on the windings; hence the motor should be taken down periodically and cleaned. The most satisfactory way of cleaning is to blow the dust out with a hand bellows. Violent air jets from compressor tanks are likely to carry excessive moisture and may move the windings sufficiently to cause rubbing and consequent damage to the insulation. Oil films may be removed by using carbon-tetrachloride, a common chemical sometimes sold as a cleaner under trade names. Use only as much as is needed to remove the oily dirt. Exposed windings should receive a coat of good insulating varnish occasionally. If a motor is flooded with water, it should be thoroughly dried before using. The drying should be supervised by someone familiar with motor repairing, but it can be done by anyone who is equipped with an oven in which the temperature can be controlled. The drying temperature should not be in excess of 190° F. Dirt left by muddy water should be washed off with a gentle stream of clear water before the motor is dried. Before being put back into service, the motor should be tested for grounds and short circuits in a shop equipped for making such tests. If unusual odors are noted after the motor is started, the power should be cut off immediately and further tests made for short circuits. A motor develops a uniform turning moment around the rotor; because of this there is no shock or vibration on the motor bearing. If a motor is properly mounted on a solid support, the only wear on the bearings will be that due to the weight of the rotating part and the force of the pull of the belt. In mounting a motor see that no twist is put into the frame and that no unnecessary force is put upon the shaft by improper alignment. A bearing is designed for a definite thrust load or force on its surface. If this load is exceeded, rapid wear results. A belt that is too tight will overload a bearing and cause abnormal wear and undue heating. For this reason a belt should be made just tight enough to prevent slipping, and the tension should be released when the belt is not in use. A good way to determine the proper tightness of a belt is first to make it loose enough to slip, then tighten it just enough to prevent slipping. V-pulleys and V-belts are in general more satisfactory for small motors than flat pulleys and belts. Small motors with low starting torque will not start if the bearings become badly worn. It should never be assumed that a starting winding is burned out until the bearings have been tested. This can usually be done by turning the motor upside down and seeing if it will start, or noting if rubbing can be detected when the motor ia turned by hand. (Drain oil wells first.) If it will start, install new bearings. Never allow a bearing to wear until the insulation is scraped off the windings by the rotor. Either sleeve bearings (fig. 8, A) or ball bearings (fig. 8, B) are used on single-phase motors. Figure 8, A, shows a cross section of a sleeve bearing with ring-oiling feature. 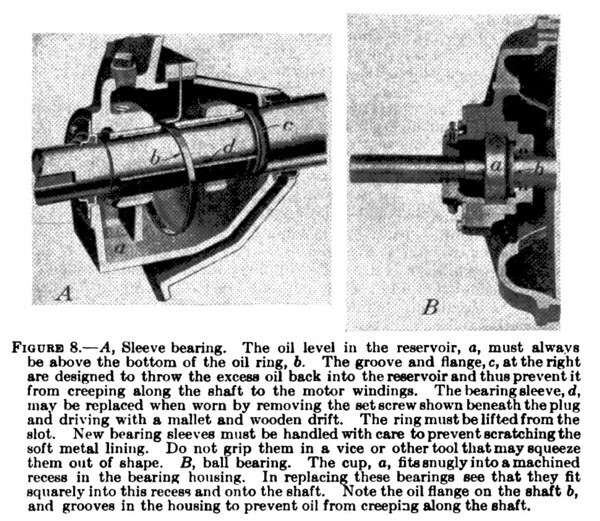 The oil ring, b, carries the oil from the reservoir to the shaft. If the reservoir is filled until the surface reaches the shaft, the flange cannot throw the oil back into the reservoir. Hence, too much oil may be as bad as too little. Wick-type bearings, shown in figures 6 and 8, should not receive more oil than the wick will retain. Bearings may be lubricated with grease or oil. Oil-lubricated bearings are usually built with reservoirs that will hold enough oil for several weeks. However, daily inspection of the oil and the oiling mechanism is desirable in order to keep the reservoir filled to the proper level and to see that the rings are functioning. Most oil companies manufacture special oils and greases for electric motors and no other should be used. If a motor is used frequently, its bearings should be cleaned once each year. The oil should be drained from the reservoir, the bearings washed with carbon tetrachloride, and new oil added. Never allow oil to get into the windings. Keep bearings free of grit. Even a small quantity of grit in the grease will destroy the bearing. For this reason, in cleaning bearings handle them with care. Keep grease and oil in tightly closed containers to prevent the entrance of dust and dirt. Motors may be mounted against walls or overhead if the bearing brackets are taken off and turned a quarter of the way or halfway around. The bolts which hold the bearing brackets of a motor to the frame are arranged so that the bearing bracket can be put onto the frame at any quarter-way position. The motor can, therefore, be mounted in any of four positions and still have the oil reservoir in proper place. Electric motors with oil-lubricated bearings designed to operate with shafts in the horizontal position should never be mounted with shafts vertical. Some ball-bearing motors may be operated in any position, but the manufacturer should be consulted before a motor is used in a position other than that indicated by the original position of the base and oiling facilities. A good motor may not perform satisfactorily if improperly installed. Motors designed for horizontal operation should always be mounted with the shaft horizontal. Use a hand level even on small motors. Take care to see that the shafts of vertical motors are vertical. Usually one bearing of a vertical motor is designed to carry end thrust while the other acts merely as a guide bearing and is not intended to carry thrust in any direction; hence, a vertical motor should not ordinarily be belt-connected to its load. Motors mounted in positions other than those for which they were designed will frequently develop bearing troubles, because they will not receive proper lubrication and will be subjected to pressures at points not designed to carry them. Mount the motor on a smooth, solid foundation. Even though a motor frame may appear rigid, it may be distorted if mounted on an uneven surface. Any twisting of the motor frame will result in unnecessary binding of the shaft in the bearings, resulting in rapid wear and heated bearings. Bolt the motor firmly to its foundation. Loose mounting bolts will result in vibration and misalignment. If it is desirable to mount the motor on skids, a truck, or other portable body, be certain that the framework upon which it is mounted is rigid so that when it is set on uneven ground the strain will not be transferred to the motor frame. If possible, mount the motor where it will not be exposed to excessive moisture or dust, especially abrasive material. Set the motor where it will not be in the way. A guard of some kind should protect humans or other creatures from touching it while it is operating. Mount the control within easy and natural reach of the operator and in a position where the motor can be plainly seen. The motor frame should be effectively grounded. Although motors are usually tested before they leave the factory, the insulation may sometimes fail in which case the motor frame may become alive. A reliable ground will assure the safety of the operator. In connecting a motor into an electric circuit note the nameplate data and diagram of connections and follow the manufacturer's directions implicitly. Single-phase motors may be connected to any two wires of a three-phase circuit provided the voltage is correct. If the motor is to be connected to the load by means of a belt, consideration must be given to methods of maintaining proper belt tension. Figures 9 and 10 show methods frequently used. If the motor is used for several jobs it may be desirable to resort to a quicker way of tightening the belt. 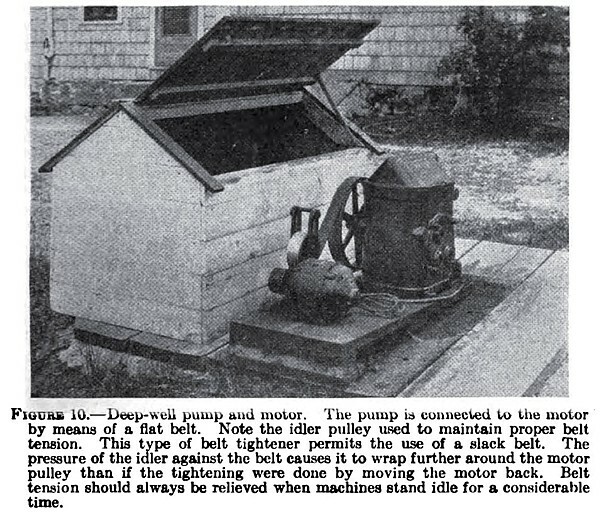 Figure 11 shows a scheme for doing this, allowing the motor to tighten the belt automatically. First a piece of ¾ or 1-inch pipe is securely fastened to the bench at the correct distance from the machine for the given belt. The base of the motor is fitted with a pair of angle irons or wooden cleats, which will fit snugly over the pipe. The pipe is so placed that the motor will not balance on it but will drop back and tighten the belt by its weight. A little experience will show the proper location for the angle irons. It is best to start with the weight of the motor almost balanced and move the angle irons until the desired belt tension is reached. Any number of machines may be operated by one motor simply by fastening a piece of pipe at the proper distance from each machine, upon which the motor with its attached angle irons may be set and belted to the machine. Electric motors may be connected directly to the loads they are to drive or by means of a belt or chain. In connecting directly, the machine or tool may be mounted on the extended end of the motor shaft. Fans are often mounted this way and vacuum cleaners always. Occasionally certain pumps and compressors are connected in this way. Larger loads are not usually mounted on the motor shaft but on a separate shaft, which is connected to the motor through a flexible coupling. Although the center lines of the two shafts should be as nearly in line as possible, there will nearly always be some small offset, but the flexible coupling prevents vibration. Even though a flexible coupling is used, alinement of the driving and driven shafts is important. Any misalinement means loss of energy through heating the coupling and excessive wear on bearings. The belt is probably the most common means of transmitting energy from a motor to its load. One form is the flat belt made of leather or rubberized cotton fabric, but the V-belt is increasing rapidly in popularity. It grips the pulleys firmly and may be operated with less tension than flat belts, thus relieving the bearings of considerable pressure (fig. 9). Flat belts, if they do not slip much, will not run off properly aligned pulleys unless thay are overloaded or the load is applied too rapidly. Pulley shafts should be parallel, and the crown of the driving pulley should be directly in line (in the same plane) with the crown of the driven pulley. 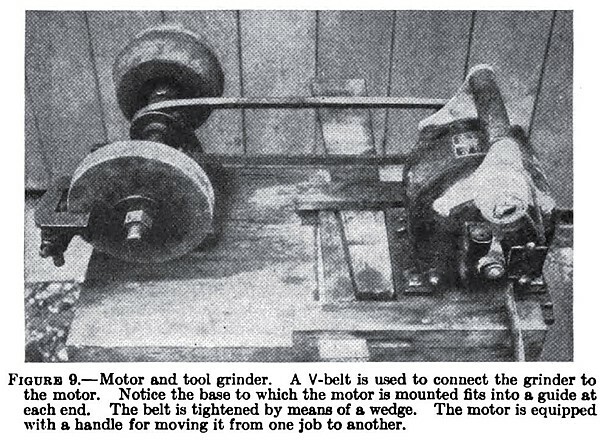 The same rule holds true for the bottoms of the grooves in V-pulleys. Any misalinement produces wear on bearings and belts. Pullevs for flat belts are faced with a slight crown at the middle, which increases centrifugal force there, causing the belt to creep in from the ends and to stay on. Idler pulleys are frequently used to maintain proper belt tension when flat belts are used (fig. 10). Metal-link or silent chain belts (fig. 12) are much like roller chains but run somewhat more smoothly and may be operated at higher speeds. They do not slip and, like the V-belt, may be run reasonably slack. Silent chains have long life when given proper care. If the motor runs continuously or almost so, it is more satisfactory to have it directly connected to its load. It sometimes happens that the load and motor speeds are different, in which case a gear motor may be used. Gear-motor ratios of practically any value may be purchased. Belts and pulleys transmit power from motor to machine, and they change the ratio of speeds to suit the machines. The belt must be strong enough to transmit the torque, and the pulley must be large enough to prevent slipping of the belt. These factors determine the width and thickness of the belt and the size of the smaller pulley. Because of belt slippage, speed ratios cannot be maintained exactly with belt drives. For this reason, as well as because of the cost of maintaining belts, the direct drive is preferred wherever feasible. When a V-belt is to be used the motor should be equipped with a standard V-grooved pulley, the number of grooves depending upon the amount of power to be transmitted. These pulleys are made of cast iron, pressed steel, or die-cast alloy. Pulleys for flat belts are usually made of paper. Paper pulleys are rugged and will last a long time if kept dry and given other reasonable care. Shafts are machined to a standard size for a given capacity motor. If new pulleys fit the shaft too tightly, material should be removed from the pulley and not from the shaft. The set screw should turn down onto the key or flattened part of the shaft. If the key does not slide smoothly into the seat, the key rather than the seat should be corrected. Never grip the shaft with a pipe wrench or similar tool as that roughens the surface. Remove pulleys with a pulley puller, and do not use a hard material to hammer the shaft. When the pulley is to be left off the shaft, wrap shaft, with key in seat, with friction tape. Prevent rusting of the shaft by smearing a little cup grease on the surface. The grease will do no harm even if it is not all removed when the pulley is mounted. The starting switch and protective device are just as much parts of the motor as its pulleys and base. The control switch may be an ordinary snap switch, such as is commonly used on motors of one-quarter horsepower or less. Larger motors have switches or other control devices of ample current-carrying and breaking capacity. If it is desirable to control the motor from some distance, a push button and magnetic switch should be used. This type of equipment lends itself to control from more than one station. Special devices should be used to prevent damage to motors from overloading and undervoltage. It has already been pointed out that both overloading and undervoltage cause the motor to draw excessive current from the line and that overcurrents cause excessive heating. If the current is temporarily interrupted with the motor fully loaded, damage may result when power is restored unless the load is reduced. Undervoltage devices are designed to open the circuit to prevent the motor from starting automatically when the power comes on again. All motors require an overcurrent in starting; hence devices that will protect them must not open the circuit too quickly, or they will interfere with normal starting. For this reason some sort of thermal device of a capacity matching that of the motor it is to protect is as the motor. Both the overcurrent and undervoltage devices may be connected to the magnetic switch so that they open only the circuit of the magnetic coil, thus allowing the switch to drop open by gravity. Safety equipment of this kind adds somewhat to the cost of motors but is good insurance. These protective devices are not intended to protect the circuit carrying current to the motor. The regular circuit fusing should be used also. Fuses should open the circuit quickly when their rated capacity has been exceeded; hence a fuse with sufficient capacity to carry the starting current of a motor will afford little or no protection against ordinary overloads; and, conversely, a fuse that will protect the motor against overloads will not carry the current necessary to start the motor, particularly if the motor must start with load. The rule then is to protect the circuit with a fuse or circuit breaker having capacity just above the starting-current requirement of the motor under its normal load and to provide overload protection to the motor with a thermal or other inversc-time-delay device which will open the circuit if the overload persists for more than a short time and will not open the circuit during momentary overloads or when the motor is started (fig. 13). There are many chores that can be done with electric power. Several of these chores are listed in table 4. The recommendations are not necessarily arbitrary, but experience has shown that such motors give satisfactory results. Motor capacities will depend to a large extent upon the size and capacities of the machines they are expected to drive. If there is any question concerning the size and type of motor to buy for a given machine, consult a motor specialist. In replacing a gasoline engine with an electric motor consideration should be given to the fact that electric motors generally have considerable short-time overload capacity, whereas gasoline engines do not. Also the capacity of the gasoline engine is reduced with wear. By definition, a horsepower is the same for gasoline engines as for electric motors, but for the aforementioned reasons it is reasonably safe to assume that a motor rated at two-thirds to three-fourths that of the gasoline engine will be satisfactory. It must be remembered that the speed of the electric motor is usually greater than that of the gasoline engine, and pulleys must be selected accordingly. Although well-made electric motors will give trouble-free service for many years, they will occasionally give trouble and may even fail to operate. Some of the troubles may require the services of an electrician, but many of them can be corrected by the owner. 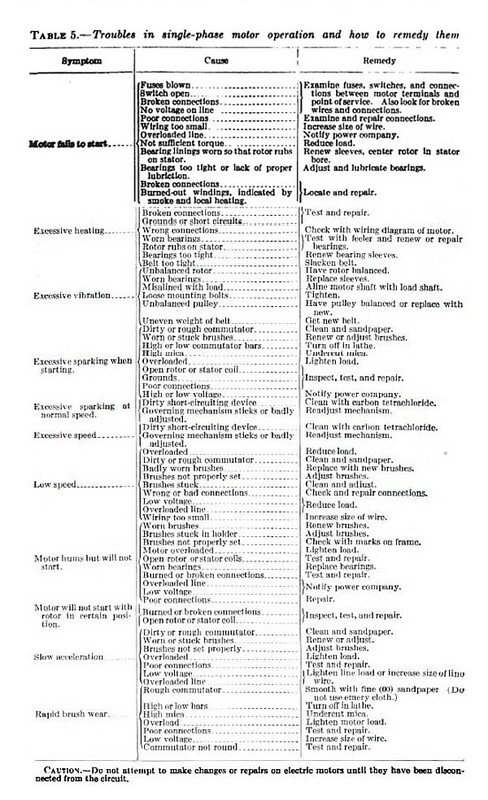 The trouble chart, table 5, showing symptoms, causes, and remedies, has been compiled as a guide in such cases. A motor is an apparatus for changing electrical energy into mechanical energy; hence must be a part of an electric circuit. Voltage must be applied to it, and current must flow through its windings. Figure 13 shows a motor connected in an electric circuit. The generator, which must be driven by some mechanical means, such as a gas, diesel, or steam engine or water wheel, supplies energy to the motor. It does this by generating an electromotive force (voltage) which, when the circuit is closed, will cause a current to flow. Part of the power delivered to a motor is changed into heat and performs no useful work. The energy that is not changed into heat is delivered by the motor as mechanical energy and is available for useful work. The voltage of the circuit. The design of the motor. The amount of power delivered by the motor. The voltage supply is fixed and nearly constant, and the motor should be chosen to suit this voltage supply. The motor automatically regulates the current within the limits of its rating so that it uses only slightly more than is required to drive its load. It receives electric power in the form of volts and amperes and supplies mechanical power in the form of torque and rotation of the shaft. When current flows in a wire, a magnetic field surrounds it. The intensity of the field is a measure of the current and will increase or decrease in direct ratio as the current increases or decreases. If a wire is wound into a coil, a stronger magnetic field is produced. If the coil is wound around an iron core (fig. 14), the magnetic density is increased. 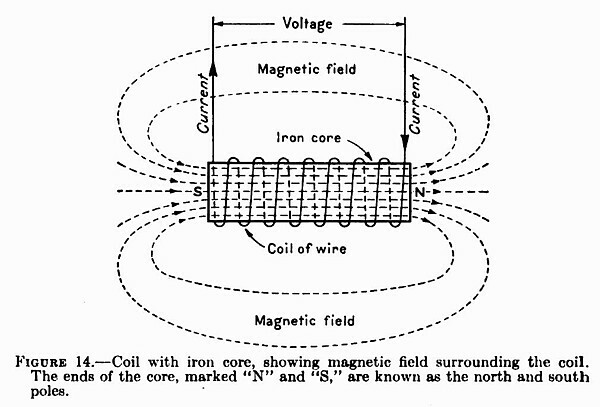 Strong magnetic fields are produced in motors by winding coils of wire around iron poles and causing an electric current to flow through the coils by applying a voltage to them. A magnetic field set up in this way is used to produce a force on a conductor which will develop torque. If a current flows in a conductor, shown in the magnetic field in figure 15, there will be a force acting on the conductor. 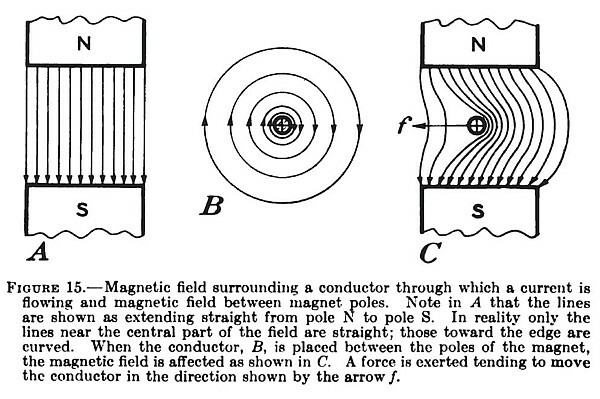 The magnitude of the force will depend upon the strength of the magnetic field, the length of the part of the conductor in the field that is perpendicular to it, and the amount of current the conductor carries. The direction of the force will depend upon the direction of the field and the direction of the current in the conductor. The force will be independent of the source of either the magnetic field or the current. The same current that sets up the field may be used in the conductor on which the force is produced. It is so used in the series motor. In figure 15 note, that the lines of magnetic flux surrounding the conductor in B are clockwise. If the conductor carrying current is placed in the field A, the action will be as if the lines of flux surrounding the conductor reacted upon the lines of flux between the poles. This action will decrease the field strength on the side of the conductor where the flux lines are in opposite directions and increase them on the side where the lines are in the same direction. The result of the action between the two will tend to pull the magnetic flux around the conductor, as is shown in C. By thinking of these flux lines as stretched rubber bands it can be seen from the diagram that the conductor will tend to move toward the left. The force moving the conductor will depend upon the flux density of the field A, the current in the conductor B, and the length of the conductor which lies in the field. 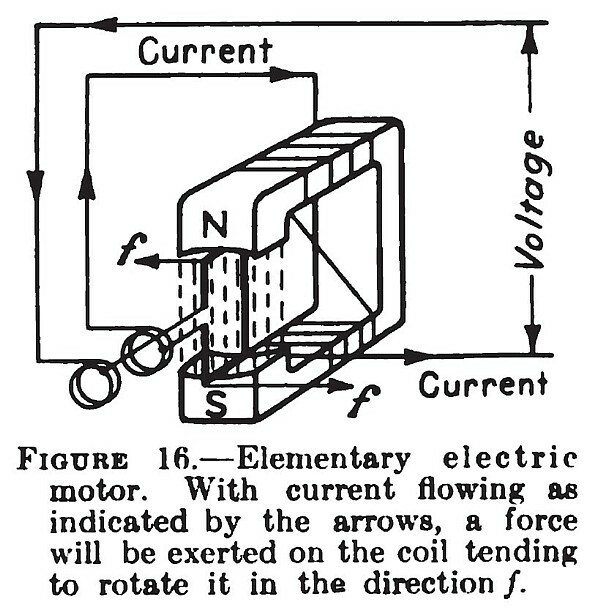 If, instead of a single wire, a coil of wire is placed in the field, as is shown in figure 16, forces f,f, that will produce a turning moment, will be exerted upon the conductors of the coil, and it will tend to rotate in the direction shown by the arrows. Motors are built by winding several turns of wire on an iron rotor and supporting them by means of a shaft in bearings so that the coils are free to move. The forces on the conductors are made to act always in the same direction by causing the current to flow in the same direction under like poles. This is accomplished in series and repulsion motors by means of the commutator and in other motors by means of induced currents. It reverses the current in the conductors on the rotor as they pass under first one pole and then another. It conducts the current through a sliding contact from the external circuit to the rotor. In the diagram of the motor shown by figure 17 both the current in the conductor and the magnetic field are set up by direct application of voltage. A more common type of alternating current motor is one in which the currents in some of the conductors are induced by a changing magnetic field. This involves another electrical law, the law of induced electromotive force. A coil of wire will have a voltage induced in it if the magnetic flux linking (looping through) the coil is changed. If a current flows in the coil because of the induced voltage, there will be a force between the magnetic field and the coil opposing the change of flux linking the coil. This law explains how a motor can be self-regulating. Because of the speed of rotation of the rotor the flux linking the coils is continually changing. This change in flux induces a voltage in the coils which is nearly opposite in direction to the voltage that is sending the current through the stator and in terms of the stator circuit nearly equal to it. The amount of current that flows through the rotor circuit is determined by the difference between the voltage applied to and that induced m the stator circuit. The induced voltage, which is caused by a change in flux linkage, will depend upon the speed of the rotor. If load is applied to the rotor, it slows down. The decrease in generated voltage allows more current to flow in the coils, which produces more power. If the load is removed from the rotor, it runs faster, more voltage is generated and less current flows in the rotor circuit. The motor, at the greater speed receives less power from its supply; hence it regulates its own. Certain types of alternating current motors have only one part of the motor (rotor or stator) connected to the supply voltage. The law of induced electromotive force which has just been stated may be used to explain the operation of such motors. These motors can be explained best by referring to the series motor shown in figure 17, A, in which the same current flows through the rotor (armature) as the stator (field). This current flows into the motor from the external circuit. If the voltage applied to the motor is reversed, the current in both the armature and the field is reversed. The reversal of current in both parts of the motor at the same time does not reverse the direction of the torque. For this reason a series motor will run on either alternating or direct current. If the electrical connections of a series motor are changed so that they are like those shown in figure 17, B, the motor is a repulsion motor and will run only on alternating current. The current cannot be conducted to the rotor but must be induced in the windings by the changing magnetic field. 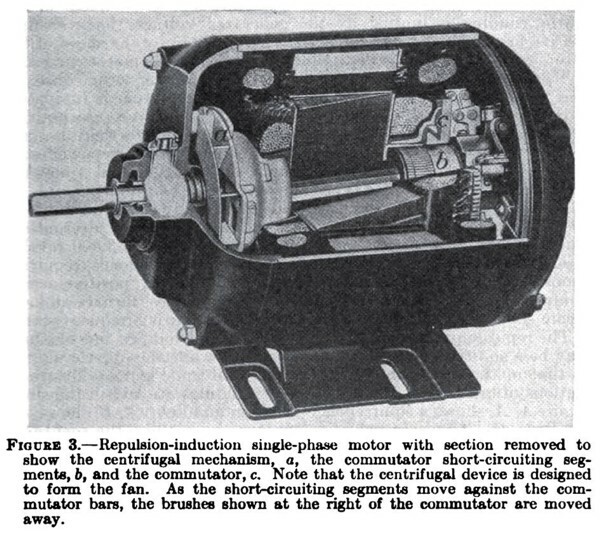 The repulsion motor is like the series motor in every detail except the connection of the brushes and their position on the commutator. The fundamental difference between the two motors is that the current of the series motor is conducted to the armature from the external circuit, while in the repulsion motor the current is induced in the armature by the changing magnetic flux. The windings on the rotors are closed; that is, the end of one coil is connected to the beginning of the next until all coils connected are in series, the end of the series being connected to the beginning. A closed winding is illustrated by diagram (fig. 17, O). No current will flow around the winding except through an external connection because the voltages around the circuit are balanced. If the short-circuited brushes are placed in position a (fig. 17, B) no current will flow through the short circuit because at the position midway between the poles the voltage between the brushes is zero. By moving the brushes to the position b the voltage between them is unbalanced, and a current will flow through the short circuit. This current will divide through the armature paths. Because of the current in the armature conductors and the magnetic field in which they are located, a force will be produced which will tend to turn the rotor. If the commutator segments of the repulsion motor are short-circuited one to the other, the motor becomes an induction motor. Rotation of the rotor produces an unbalance in the voltage in the windings which causes a current to flow. A force is set up between the conductors carrying the current and the magnetic field, thus producing a torque in the direction of rotation. The single-phase induction motor has no starting torque but will run equally well in either direction if started. Induction motors do not need a commutator unless they start as repulsion motors; therefore it is cheaper to make them without commutators. In the diagrams and discussion given, one set of windings has been used to illustrate three types of motors. Because of characteristics and manufacturing costs the motors may appear to be quite different, but in the fundamental principle of operation they are as described. It is the detail of design rather than the fundamental principle of operation that determines the type of motor.